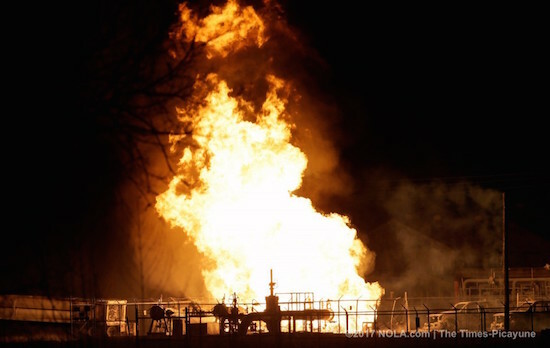 A fire burns at a Phillips 66 pipeline in Paradis, LA, Thursday. Evacuated residents returned to their homes after a Phillips 66 pipeline fire Thursday injured six workers in Paradis, St. Charles Parish, LA. The fire, which happened just before 6:30 p.m., occurred at the Phillips 66 Paradis Pipeline Station, near the Williams Discovery Plant at 15849 Old Spanish Trail. The fire broke out while six workers were cleaning the pipeline, authorities said. Residents said they heard as many as six booms during an explosion which occurred during what Phillips 66 officials call a routine maintenance operation. Six workers from two companies — three from Phillips Petroleum and three from Blanchard Contractors — were cleaning the 20-inch line when a valve or gasket failed, said St. Charles Parish Sheriff Greg Champagne. One of the injured workers remains hospitalized. Officials have yet to identify the employee who was missing after the explosion. The three other workers suffered minor injuries. Officials said a perimeter was set up to monitor air quality in the area. There are currently no readings showing anything harmful. Officials said the fire was going down and that pressure is falling in the pipeline. Crews were hoping to clamp the pipe to allow for a quicker burnout. Champagne said the fire was 30-40 feet wide and just as high. He said it could burn for hours or even days, and that the safest course of action was to let it burn itself out. The pipeline, which runs from Venice to Paradis, carries y-grade, or raw, natural gas liquids, according to a Phillips statement. It is a highly volatile liquid that’s used to make butane and propane, said Todd Denton, general manager of midstream operations for Phillips 66.